August 22. After two and a half weeks with little Eliot, saying good-bye was not easy. Melanie thought that she might cry, but the next morning we left without the anticipated melodrama. Seated on the front lawn with his mother, we waved good-bye to him with the thought that the good times we shared with him will have to sustain us until our next visit. Then he and his parents will be settled into their new home and, naturally, he will be walking with a much expanded vocabulary that will have progressed from his current babblings of “ba” to a richer repertoire of melodic phrasings. The next stop on our nomadic journey was Bend, Oregon, to visit Don and Joanne Christensen, friends from our days in Arcata/Eureka. Not until then did we get our first clear sighting of Mt. Hood. The rolling hills with its masses of tall thick green foliage gave way to the flatlands of desert sagebrush as we descended on the other side of the mountain toward Bend. The sudden and stark contrast of the two landscapes was a quick reminder of this country’s vast and varied topography. 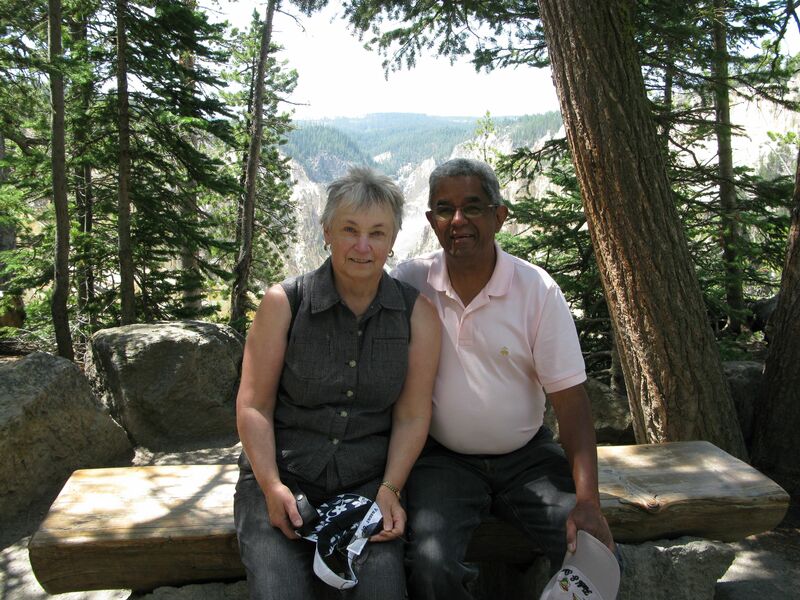 Our time with Don and Joanne is always relaxing; their home in the high desert was a welcoming retreat from the whirlwind of our travels. Don and I served together as vice presidents at Humboldt State University, he in public administration and I in Academic Affairs. With each visit at Don and Joanne’s, we experience something new. This time we attended the annual art fair along the Deschutes River. Each couple made purchases; ours was a wedding gift for my niece in Baton Rouge; theirs a wooden bowl for the dining room. Its final resting place is not yet determined and the subject of much speculation. But it will surely complement the artful décor of their grand home. Perhaps their home’s most endearing charm is the cinematic sunsets of Mt. Bachelor framed by the windows in their kitchen and family room. As we sat at dinner one evening, the sky was ablaze in color; the sunset of dark, magenta rays bathed Mt. Bachelor in a magical glow. From Bend we traveled to Ashland to visit another dear friend from our Northern California days, emeritus professor of French, James Gaasch. In the mid-nineties, Melanie and I had an experience of a lifetime when we visited him and his late wife Isabel in Rabat, Morocco, where he taught on a yearlong Fulbright. To this day we talk fondly of our travels in the desert, the wonderful food prepared by their cook, Fifi, and that special time when all four of us, traveling by train, reviewed the transcripts of James’ interviews with writers of the Maghreb. Since we hadn’t seen James since 1999, although we’ve kept in touch, our reunion was special. His current research on native masks from Mali and Burkina Faso is fascinating. Over the years he has amassed an enviable collection of museum-quality modern masks. We regret that our visit with him and his friend, Dorothy, lasted only an evening and did not allow time to take in a play at the Oregon Shakespeare Festival as anticipated. Since leaving Portland, we have been in a whirlwind of a tour, visiting friends. From Ashland, we scurried along to spend a day and half with friends in Crescent City, California. 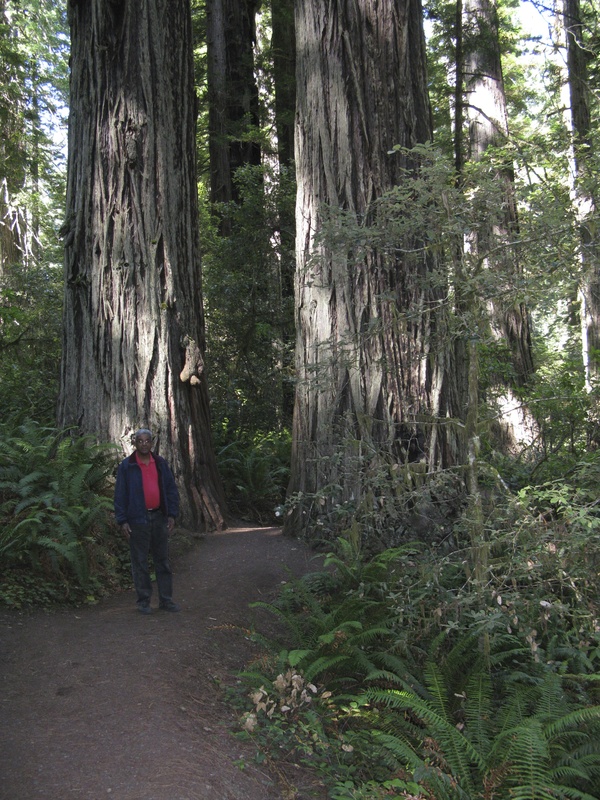 Before arriving, we stopped for reminiscing visits at Jedediah Smith National Forest and Lady Byrd Johnson Grove, where we took a long walk among the majestic redwoods. 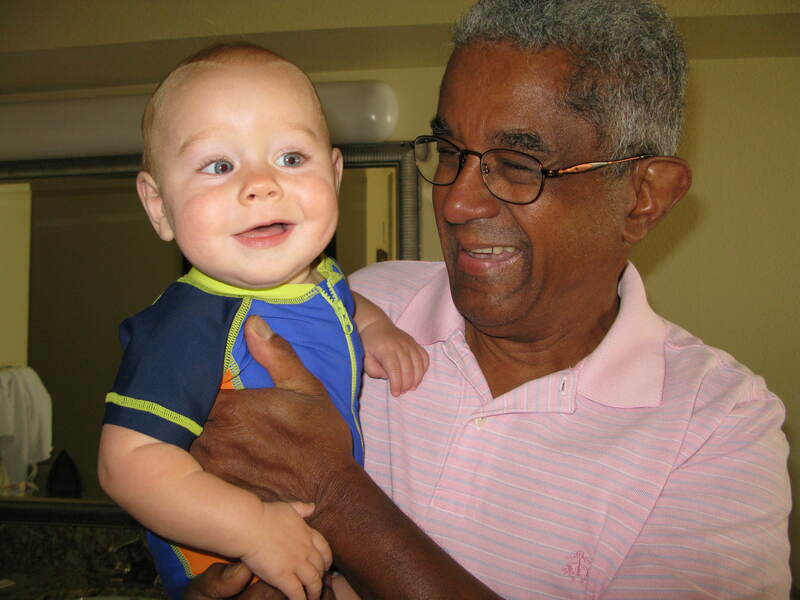 We stayed overnight with longtime friends of Melanie, Rande Rothman and her husband, Samuel Escobar. Rande is a creative silkscreen painter and artisan, who now teaches privately in her studio at home that fronts the Pacific Ocean. 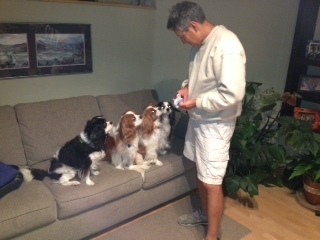 She and Samuel adore their four Cavalier King Charles spaniels. The temperature in Crescent was exactly as I remembered Northern California to be, chilly and overcast. The next day’s morning fog shrouded the Pacific Ocean. From Crescent City we traveled further south toward Eureka, but not without stopping first at Trinidad, where we lunched and McKinleyville where I used to live. Later in the afternoon, we arrived at our friend’s wooded hide-a-way in the hills overlooking Humboldt Bay. The Yankes, Katy and Mike, are two of Melanie’s longstanding closest friends. Kay is a fused-glass artist and exhibits her work in the local galleries. 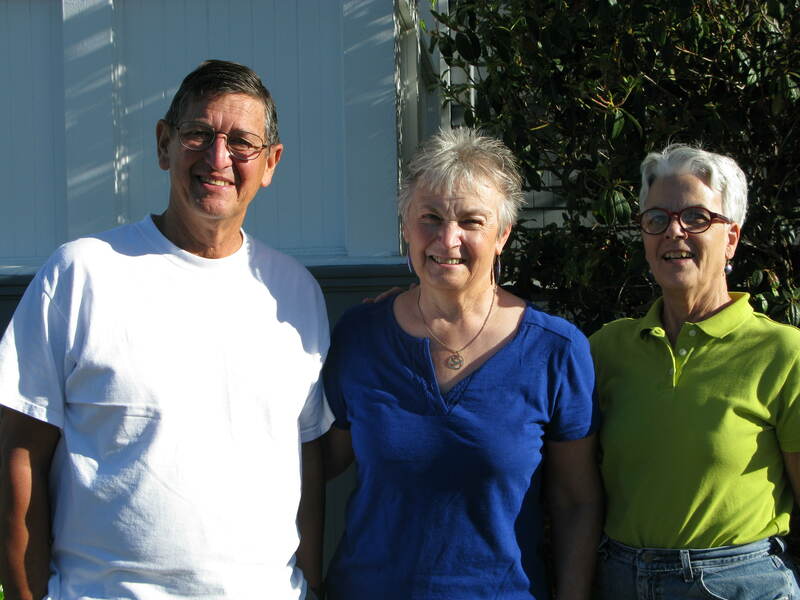 Our time with them was split between the cabin and their Victorian home in Eureka. Over the next couple of days we visited several friends, some from Melanie’s women’s group at the Unitarian Church, and friends from Humboldt State. I even had lunch with my former boss, Alistair McCrone, the retired president of Humboldt who served in that capacity for twenty-eight years. August 29. Melanie’s birthday. After a banana pancake breakfast with our friends in Eureka, we started our trek eastward by first driving south on US101. The drive through the redwood forest of Southern Humboldt reminded us of the special beauty of this region. The winding alternating ascending and descending curves were both pleasant and challenging as the roads narrowed through tunnels of towering redwoods. 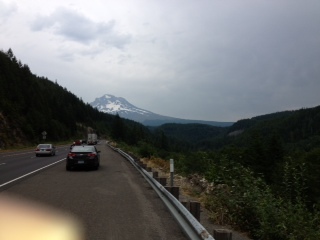 Happily, there were few cars on the road; that lessened anxiety about the slower speed we were traveling. Our eastward trek toward Sacramento brought us along Clear Lake. The towns of Nice and Lucerne bordering the lake with its resort-like qualities were clearly meant to imitate their European sisters. Increasingly the terrain turned from the rich green of the redwoods to the rolling sandy-colored hills of the desert whose starkness is heightened by the burnt terrain of earlier fires. Wildfire smoke from recent fires swathed the mountains in a lingering haze. But once we reached the central valley near Sacramento, the rolling hills gave way to flat, dusky terrain where groves of walnut and pistachio trees lined the highway. That flat dusky terrain continued until we reached the Sierras as we made our way across Nevada toward Reno where, on the advice of our friends from Eureka, we spent the night at the Sands Hotel for a princely price of thirty-nine dollars. And what a culture shock!! Clearly, we were fish-out-of-water. To reach the registration desk we had to navigate our way through smoke-filled rooms, slot machines and gaming tables occupying every inch of available floor space. The din of the noise was unbearable. Men and women, young and old, every ethnic group included, were staring like zombies at slot-machine screens. Others were bent over gaming tables, their faces in fixed gazes as a die was cast or cards flipped, all in anticipation of that life-altering win. Once safely ensconced in our room, we had trepidation about venturing out again. But we did, to the diner below to share a hamburger and salad! The next morning we started our journey before dark toward Salt Lake City. As we descended into the valley below, the mountains hovering in darkness and shrouded in wildfire haze appeared to embrace us in a cocoon. The dark night slowly evaporated into light as the glow of the rising sun turned the smokey haze pink. It was a magical start to our journey. The drive across flat, empty terrain and the sun’s rays on the asphalt created mirages of shimmering pools of water. Driving under those conditions was boring and tiring in this vast sea of nothingness. But I became curiouser and curiouser as we rolled past exits that lead seemingly to nowhere to places like Mill City, Toulon, Eureka, and Oasis. 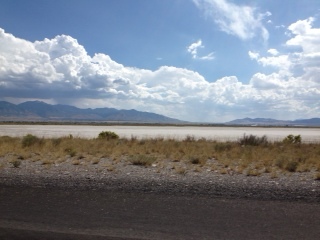 Once we crossed the Nevada/Utah border, this endless terrain of sagebrush and denuded hills changed dramatically, and almost immediately, to white flats. Tomorrow our journey home continues but not after a Labor Day weekend with friends in Cheyenne. August 17. After several days in Portland, I noticed that the early mornings were hazy and cloudy causing me to remark that the sun never shines in Portland. But it does, as Melanie so gleefully made me aware each morning we stepped outdoors into the bright sunshine. As common wisdom might have it, Portland is known for its cloudy, even misty days, particularly in the winter. But that has not really been the case since our arrival. Sunny days have been bountiful; the air fresh, cool and free of humidity. However, occasional haze has made it difficult to see clearly Mt. Hood and Mt. St. Helens. Other than this small inconvenience, our time here has been restful. Almost two months have passed since my retirement. There is a growing feeling of independence unfettered from budget woes, personnel issues, endless meetings and all the other worries that occupy a chief academic officer’s attention. The daily routine was wearing but I’m slowly settling into a routine that I determine and from which I gain personal satisfaction. I’m getting fewer and fewer e-mails. I’ve been un-subscribing myself from all those higher education newsletters and websites offering student retention, faculty development, planning, management techniques, and /or assessment services. 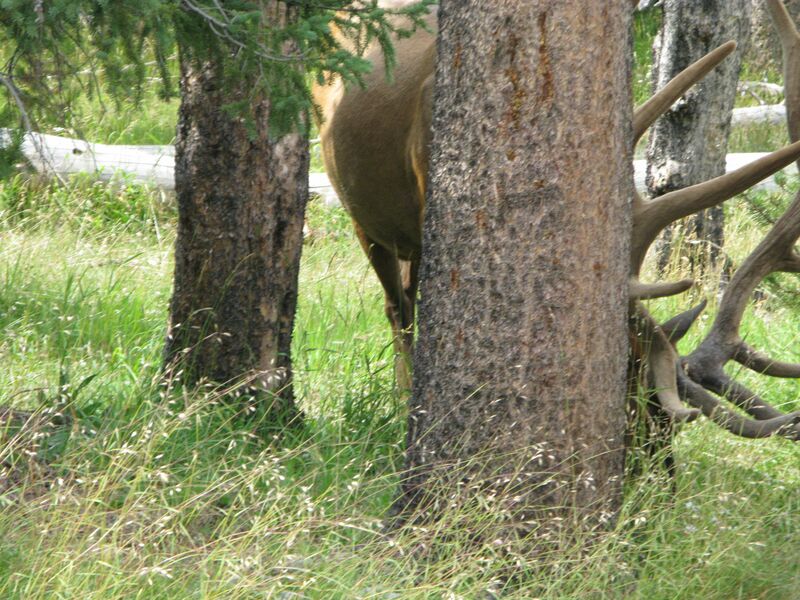 Instead, I’m getting up in the morning, exercising, reading the newspaper over breakfast, reading about the history of the Tetons, taking an occasional nap, playing with and taking walks with baby Eliot. 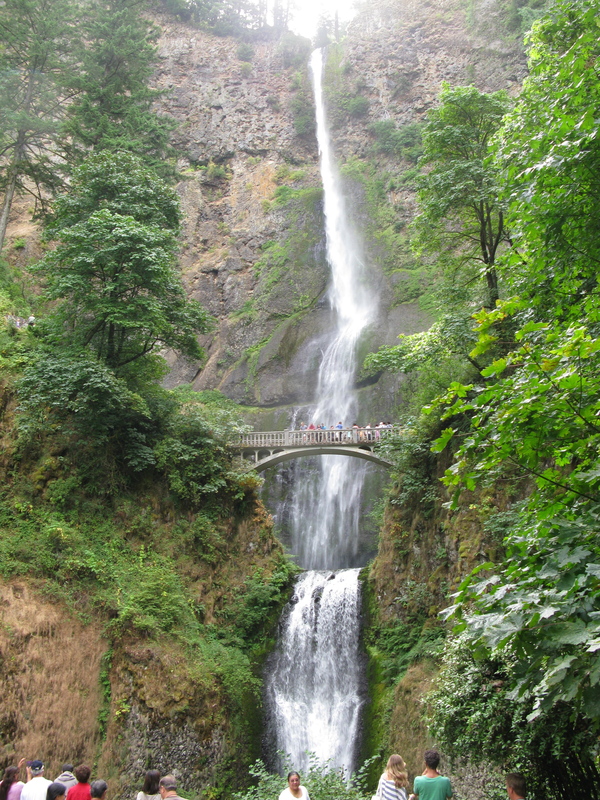 Melanie and I have found time to visit with friends in Portland, dine out, take brief excursions to Multnomah Falls and to Hood River for wine tasting. Much to our delight, we discovered a Pinot Gris with an aromatic bouquet and refreshing taste from a small Oregon vineyard, Cerulean. This morning we babysat Eliot while his parents went out for a date. He was perfectly fine for the first hour, but then he became fidgety and before long he was waling. Nothing seemed to comfort him; he was not interested in a walk, nor had he any interest in food or drink. We finally realized that he needed a nap and after some resistance, Melanie was able to lull him to sleep. To the surprise of his parents, Eliot was still sleeping when they returned. Ethan remarked that we were pros. Little did he know! In the afternoon, we helped Ethan and Nicole transport some of their belongings to their new home. Melanie occupied herself with the kitchen while the rest of us hacked away at overgrown vegetation in the yard. 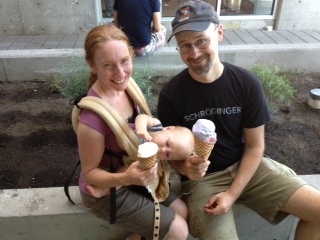 Later we treated ourselves to ice cream at Salt & Straw, a very popular place in Portland that serves fresh homemade ice cream with an eclectic array of unusual flavors, like strawberry and cilantro lime cheesecake, and goat cheese marionberry habanero. Melanie chose almond brittle with salted ganache, Nicole, sea salt with caramel ribbon, Ethan, strawberry honey balsamic vinegar with cracked black pepper and a second scoop of lavender honey, and I had a delicious pear and blue cheese ice cream. This ice cream shop is just one of the many curious and interesting things I’ve noticed about Portland. As you may already know, medical marijuana is legal in Oregon and as we drive around town we’ve noticed several medical marijuana establishments. We drive pass one of these daily, Potlandia, that bills itself as a private social club where clients in need of medical marijuana can visit in a comfortable and welcoming environment. This is also a city of bridges. I’m amazed at the intricate interweaving of bridges suspended high in the air appearing to float over the waterways and the city below. Driving on these byways can be quite intimidating, particularly for someone like me who suffers from acrophobia, a fear of heights. Yet, if you are interested in panoramic views of the city, some of these bridges offer spectacular views. But watch out for the traffic ahead!! A safer way to get panoramic views is at the summit of the Rose Garden or a stroll along Terwilliger Boulevard, near the Oregon Health and Sciences University. 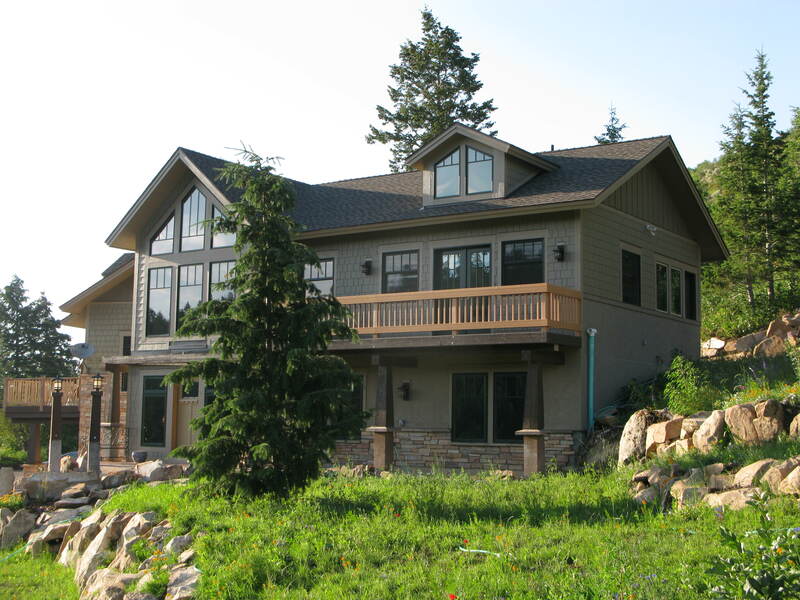 Both places offer unimpeded panoramas of the city and of Mt. Hood, the latter being visible if there is no haze. And you are free to call me old-fashioned, but I am amazed how many young people tattoo themselves. Seemingly, every person under thirty has an ornamental tattoo, and often multiple tattoos covering large swaths of their bodies. What also make Portland special are its ethnic diversity and the diverse character of its neighborhoods. Like any big city, there is the usual mix of upscale housing and modest bungalows dispersed across all quadrants of the city. But the attraction is found in city blocks grouped in districts where restaurants, brew pubs, specialty shops, boutiques, galleries and other small businesses abound. The ones I am familiar with, and have spent time in, are the Pearl District downtown near Powell’s, the Alberta District where La Petite Provence is and the Mississippi District where we had excellent margaritas at Por que No, a Mexican restaurant. There are many surprises in these pedestrian friendly districts. If you haven’t visited Portland, put it on your bucket list or happiness file. I’ve also been impressed with the Catholic Church here. To my surprise the church bulletin of St. Rita’s parish contained an enclosure, “Campaign for Human Development,” a call for action by the U. S. Catholic Bishops for parishioners to contact their representatives and senators and urge them to support bi-partisan comprehensive immigration reform, to support the Supplemental Nutrition Assistance Program (SNAP), and to replace the sequester with a “Circle of Protection.” I’m wondering if the churches in South Bend are doing the same. And before I close this missive, I must give multiple kudos to Portland; it has probably the best public transportation system of any US city that I’ve visited. In our meanderings about town, we have used the streetcar and the light rail system, locally referred to as the MAX. Their frequency and timely schedule, along with the city bus, reminds me of public transportation in France. 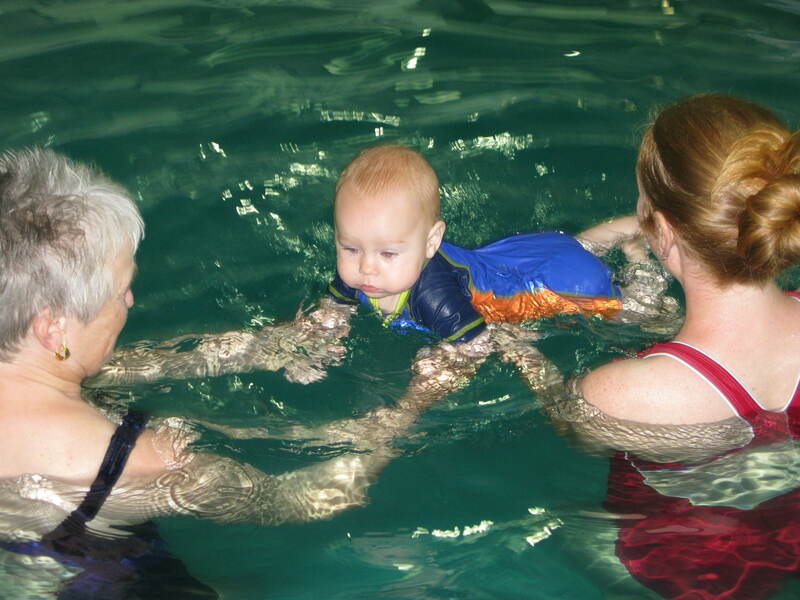 Although our main focus has been on Eliot, even swimming, we’ve managed to pack in a lot of activity. And now that our visit is coming to a close — next stops Bend, Ashland, and then Northern California –, it is dawning on us how much we will miss being with Eliot. But that only means that we will visit more frequently. And I am sure there is more to discover in Portland where the sun shines more frequently than I admit. But don’t take my word for it, come and see for yourself; you’re in for a treat. August 8, Our Anniversary. 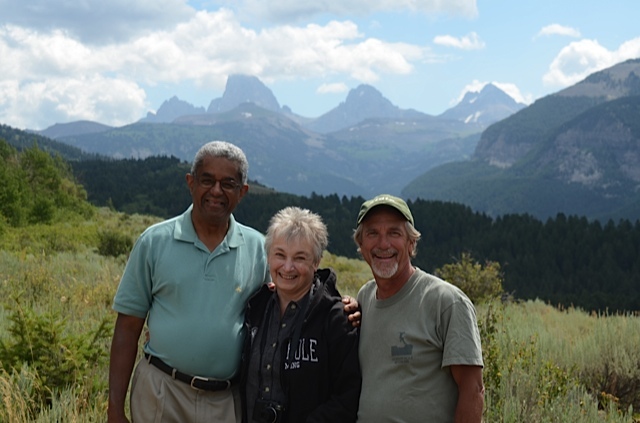 After an exhilarating week with Randy and Chris in the beautiful Tetons Range, we headed to Portland, known most famously as the City of Roses. 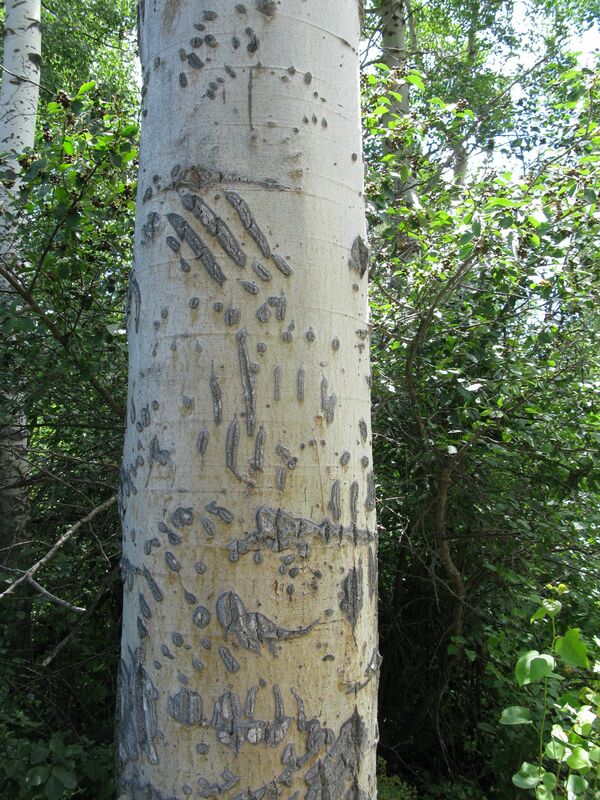 They are everywhere to be seen in this northwest city, seemingly growing wild in scattered patches of earth, and ubiquitously present in just about every home’s garden. 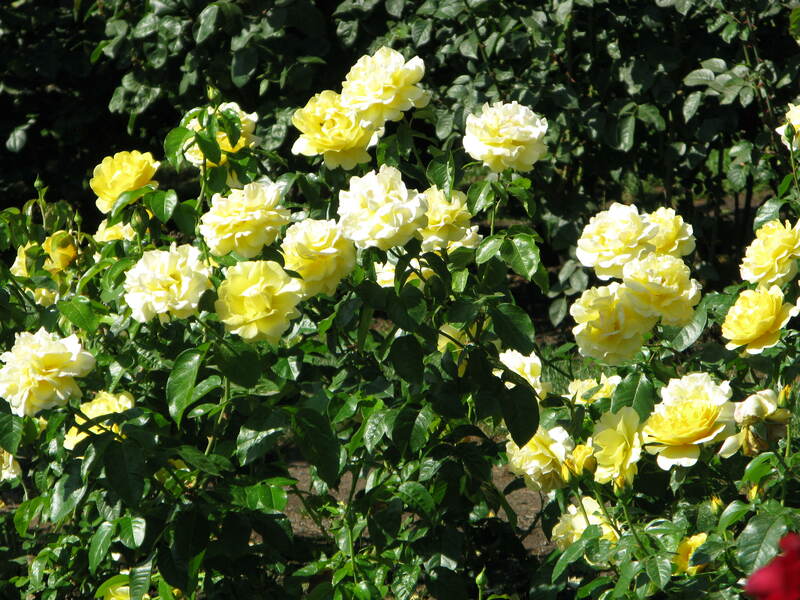 The Rose Garden in Washington Park has every imaginable color and variety of rose with its attendant aroma that offers a trove of pleasure to the senses. They bloom even in the most modest of gardens, giving the impression of hardiness with little need of care. In my own garden in Indiana, I struggle having a healthy looking rosebush. Perhaps this misty, cool climate is more conducive to their growth. What I’ve noticed here is the lack of green lawns. Perhaps they can be found in the sprawling suburbs, but at least, here in the city, the small frontage plots are converted into gardens, or left to a natural state sans watering. Some of the lawn gardens are vegetable beds of tomatoes, squash, pumpkins, herbs, beans, even corn, and whatever else the homeowner wants to grow. 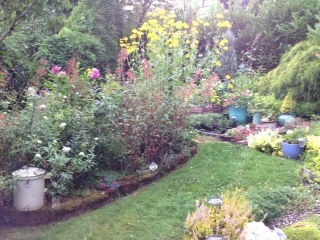 Others are a mixture of vegetables and flowers. 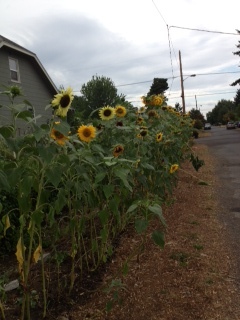 Behind a wall of sunflowers in one garden, I noticed beds of vegetables. Portland is also known for being ecologically friendly. Recycling is a big deal here. Bins and public disposal places make it easy to be environmentally conscious. Compost bins stand neatly aside trash and recycling bins — the smallest among them is the trash. Customers can redeem bottles and cans for cash. Farmer’s markets are plentiful promoting organic foods, and can be found in just about every neighborhood across the city. Healthy food is a by-product of this city that promotes healthy living. 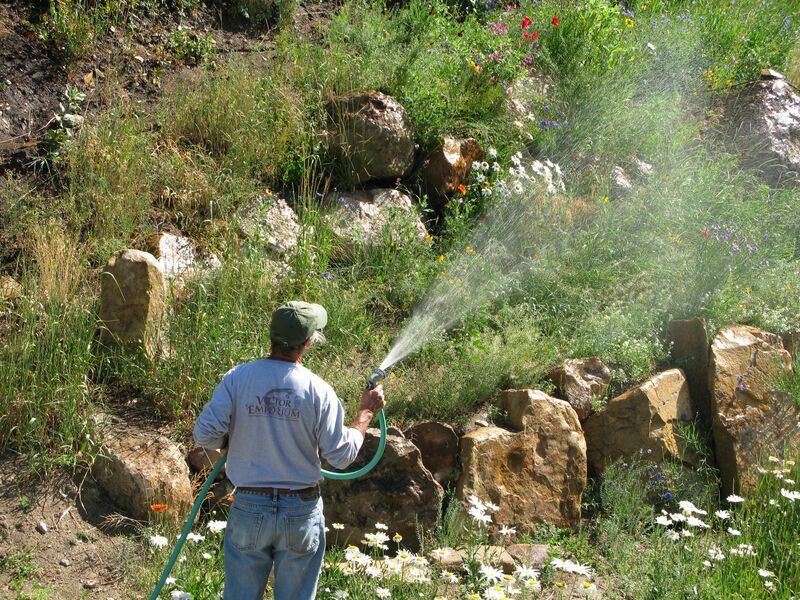 Community gardens can be found in many neighborhoods. It’s also a city of bicycles. Drivers are forever vigilant; cars politely yield to bicyclists and to pedestrians. Unlike in the Tetons, where bicyclists were out for the sport of it, here people are mounted on bikes mostly as a mode of necessary transportation. Just about everyone is riding toward a destination, some to work or shopping, others perhaps to a coffee shop to gather with friends. Few if any, appear to be riding recreationally, except in the evenings, when families are seen enjoying casual rides. The city’s moniker may be roses, but craft beers clearly define the city. Brew-pubs are seemingly as omnipresent as the roses. I’ve traveled to Portland numerous times since the early nineties and with each visit enjoy tasting a new craft beer with my stepson who is quite knowledgeable about beer and who, on occasion, has made some tasty homemade brews. It is he who introduced me to the Deschutes Brewery’s Black Butte Porter. Normally, I am not drawn to porters, — I prefer lagers or ales — but this one is not heavy; and as porters go, it pleases while still retaining its hoppy, chocolate taste. I’d relish the idea of pub hopping with several of my faculty colleagues who are craft beer aficionados. I’ll be bringing a couple of cases back to Indiana and can invite them over for a tasting. Portland’s less glamorous aura is its homelessness. I’ve always been astounded by the number and visibility of homeless people roaming the streets. It’s a problem that the city has been battling for a number of years. A former mayor pronounced an end to homelessness within ten years; and now that timeframe has passed, the problem persists. There are many anecdotes as to why Portland is attractive to the homeless — mild weather, good social services, acceptance and tolerance among the local population. But that broad-mindedness is rapidly shifting as the city desperately tries to move the homeless off the streets. A recent article by a weekly newspaper highlights the current situation. Although life circumstances took an unfortunate turn for some, surprisingly, the homeless lifestyle is a choice among many. 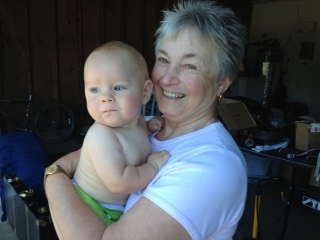 These impressions of Portland aside, the main purpose of our visit is with the new Bendotoff-Smith family addition, grandbaby Eliot, six months old. 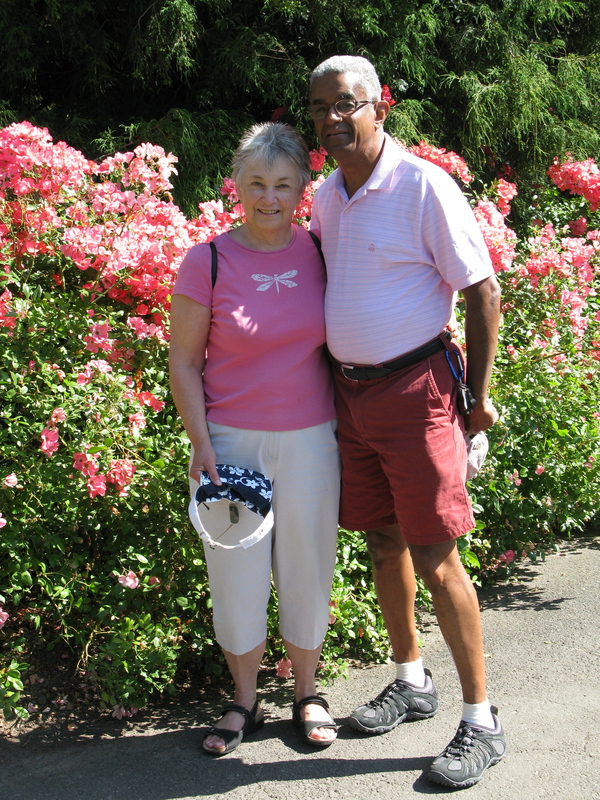 We arrived last weekend and on Sunday attended an outdoor symphony concert in the Rose Garden of Washington Park. The widely attended event was part of a two-week celebration of the arts. We picnicked on the grass with Nicole’s parents from Palo Alto, Ethan and Nicole, a friend of theirs, and Eliot. The rest of the week was spent visiting with Eliot and his parents. Melanie and I have enjoyed walking Eliot around the neighborhood in his stroller. He’s a beautiful baby with big blue eyes that light up his face. He is curious about everything around him. Melanie says he favors Ethan, his father, as a child. Today, he focused attentively on a squirrel scurrying along a telephone wire. In moments like this, it is difficult to distract him. For Melanie and me, it’s been fun observing Ethan and Nicole as parents. They have slipped naturally into parental mode and are doing very well as doting parents. And like every new parent, they are sleep deprived. Little Eliot likes to stay awake at night. Earlier in the week, we all spent an afternoon cleaning Nicole’s and Ethan’s new home, a fixer-upper that has charm and potential. That evening I cooked a pot of shrimp creole to the delight of all. Satisfying our culinary palates has been de rigueur at each of the stops on our cross-country journey. It was a good excuse to dine out on Thursday evening, at a neighborhood Spanish restaurant, Cabezon, for a three-fold celebration – Nicole’s success on her oral midwifery exam, Ethan and Nicole’s new home, and our fifteenth wedding anniversary. Each of the dishes was beautifully presented; no doubt enhancing its flavor. My meal of monkfish was absolutely divine. This morning, Melanie and I breakfasted at our favorite French restaurant, La Petite Provence, in the Alberta district, an artsy up and coming area in northeast Portland. With our coffees and croissants – made only as the French can –we shared a dish of Eggs Provencal, poached eggs on a half-tomato covered with an herbed pesto sauce. As the French would say, suberbe! There’s no second-guessing that we will return before leaving. A highlight of our Portland stay was the visit to the home of a friend, Pam Montgomery, from SVHE, the Society for Values in Higher Education. She describes her house as a tree house. Indeed, there are steep stone steps to mount, but the view of downtown, the Willamette River and the mountains is exhilarating. Built by her great grandfather at the turn of the last century, this home with its warm exterior color has a Monet-styled garden. Walking through the gardens was akin to walking through separate rooms of a home, each section at different levels defined by a particular color scheme and texture. Water features in several nooks mimicked the music of gentle flowing streams. Tucked away along the paths were statuettes of Asian foo dogs and ceramic pots. A seating area under a vine-covered pergola housed a dragon placed there by her great-grandfather; there her extended family gathers annually for a dragon ritual in his memory. After a tour of the garden and the home, we sat on the veranda overlooking the city for dessert – sorbet, pastries and port wine. Pam is a connoisseur of port. We appreciated hearing stories of generations of family history. The maternal side of her family stretches back to pre-Civil War times in New Orleans. The family home was located on Dauphine and Royal Streets. I now have another connection to my beloved city. And what would a visit be without spending a couple of hours at Powell’s, the large multi-level bookstore downtown that is as much a landmark for Portland as Mt. Hood! And if you are as much a book-lover as I am that means you won’t be leaving empty-handed. In addition to the new novel by Chimamanda Ngozi Adichie, Americanah, a view of race and America through the eyes of an African, we bought two French children’s books for Eliot. In fact, Melanie and I have been speaking to him in French; he listens attentively, and sometimes smiles. August 13. An early morning rise and walk through the Rose Garden was a perfect complement to a beautiful sunny day. We got there before hordes of bus tourists descended on the gardens enabling us to casually stroll among the multi-colored forest of fragrant roses. We spent about two hours there admiring and studying the rose bushes, the rose trees, the climbing roses. It’s like being in rose heaven. A lunch appointment at noon with another friend from SVHE pushed us out of the park; otherwise, I could have spent the entire day there. Hopefully, we’ll get a chance to return to see the Japanese Garden, one of the best, I’m told, outside of Japan. The rest of the afternoon was spent with Eliot as we strolled him around the neighborhood on his six-month birthday. August 2. “Stunning” was what Randy came up with when he and I were searching for one word that encapsulates the awe and beauty of Yellowstone. Melanie and I had never been to Yellowstone and Randy and Chris were eager to share with us the magical realism of this natural wonderland. Ah! 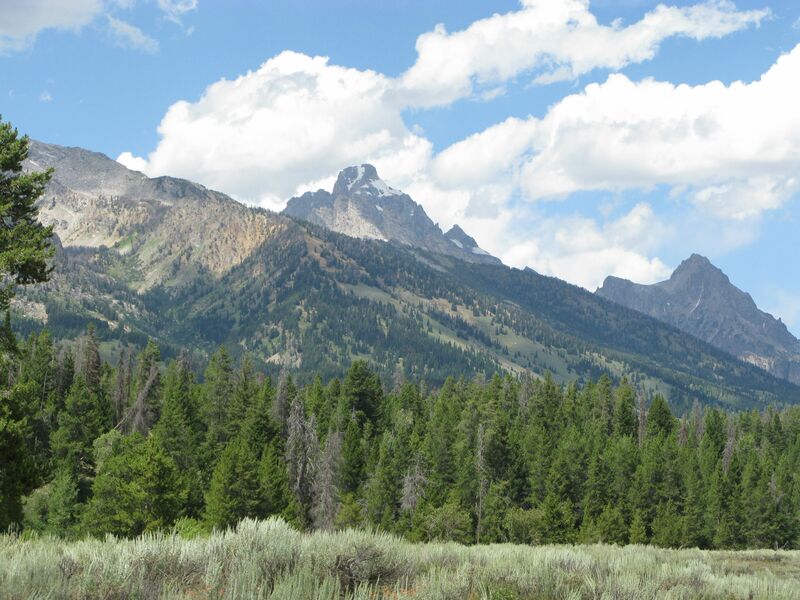 It takes little imagination to figure out why they chose to retire here on this southeast corner of Idaho, a stone’s throw from Jackson, Wyoming. On Wednesday morning, we jumped into the jeep and headed off on a three-hour journey. We sped merrily along curving hills enveloped by quilted patches of pastel yellow fields of hay and potatoes. Neatly ordered bales of hay lined the fields, the work no doubt of hearty and rugged farmers. The effect of these blended yellow hues was like an Impressionistic canvas. 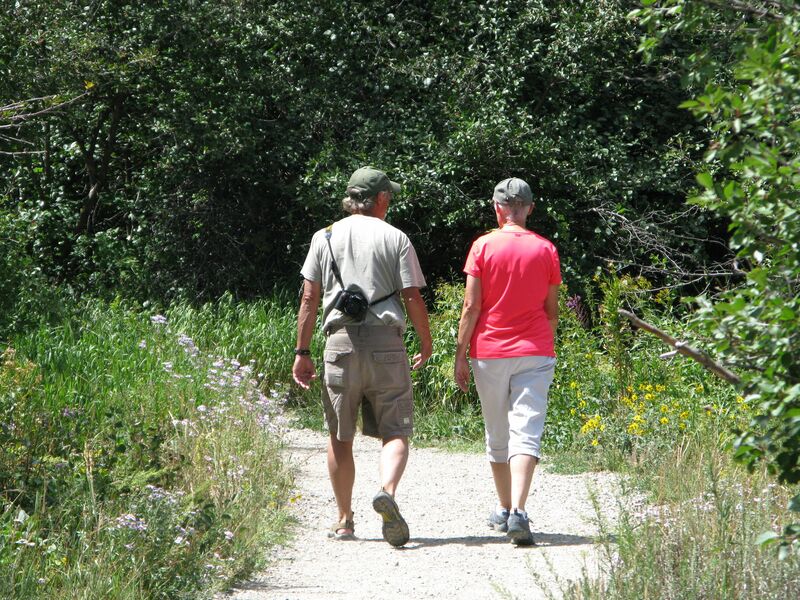 The landscape of this beautiful country naturally attracts people who love the outdoors. Bicyclists, for example, are everywhere — on the plains speeding easily along; in the mountains, some struggling uphill, others racing downhill, bike enthusiasts, all of whom enjoy the camaraderie of the sport and who, I imagine, get high on the euphoria of being mentally and physically fit. 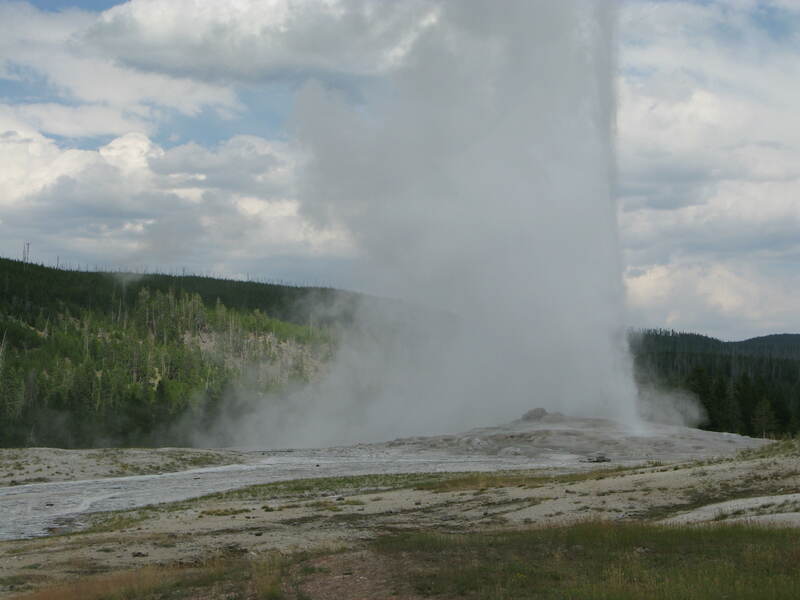 Deep within Yellowstone, emerge hordes of tourists, each one like us, seeking some splendor of nature’s beauty. Global languages abound – French, Spanish, Japanese, Chinese, Italian, German, unidentifiable Slavic languages, and British accented English. The world has come to this territory, bigger than Rhode Island, to gape in awe, like us. The intended or accidental effect of this tranquil and serene beauty is nourishment for the soul. Sitting among the crowd of strangers, waiting anxiously for the eruption of Old Faithful, the geyser, so nicknamed because of its faithful hourly gushing, was akin to sitting in a cathedral, except instead of being ensconced in the spiritual warmth of architectural icons and stained glass windows, we were enveloped by nature’s splendor. 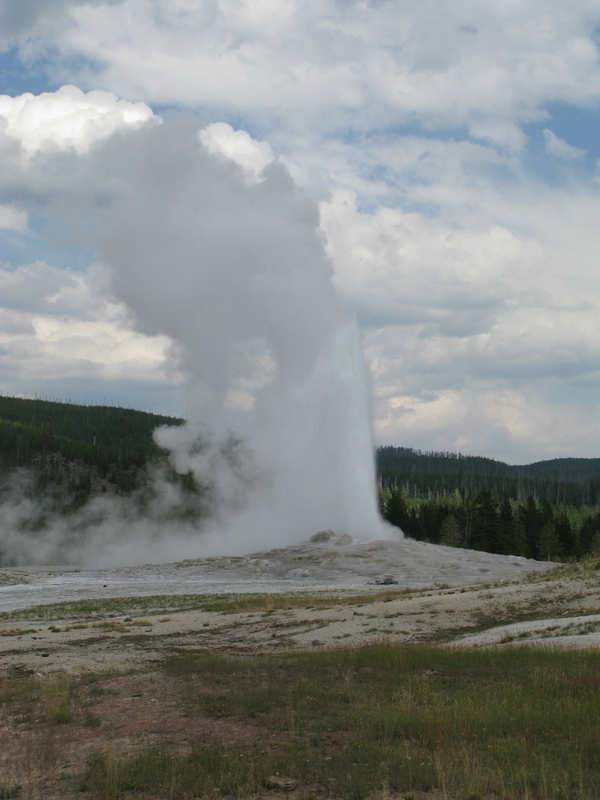 And Old Faithful did not disappoint! At the expected moment, a small gush of bubbling steam slowly ascended followed by increasingly massive eruptions that ascended skyward for dozens of feet. Quite a spectacle to behold! Other special moments included watching the cascading waterfall of Grand Canyon. At an elevation of over six thousand feet we stood and watched the cascading waters flow with a mighty force between the fissures of yellowed rock. The thunderous crashing water coupled with the whistling wind of the trees made a symphony of sounds. 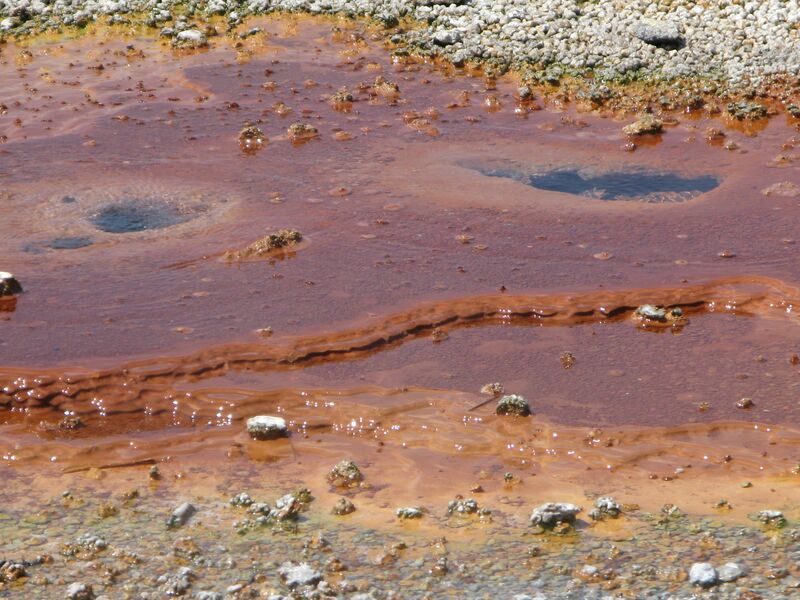 And for those fascinated with chemical reactions, the visit to the hot springs and mud pots with its oozing colors of violet, orange, black, yellow, blue and pink did not disappoint. 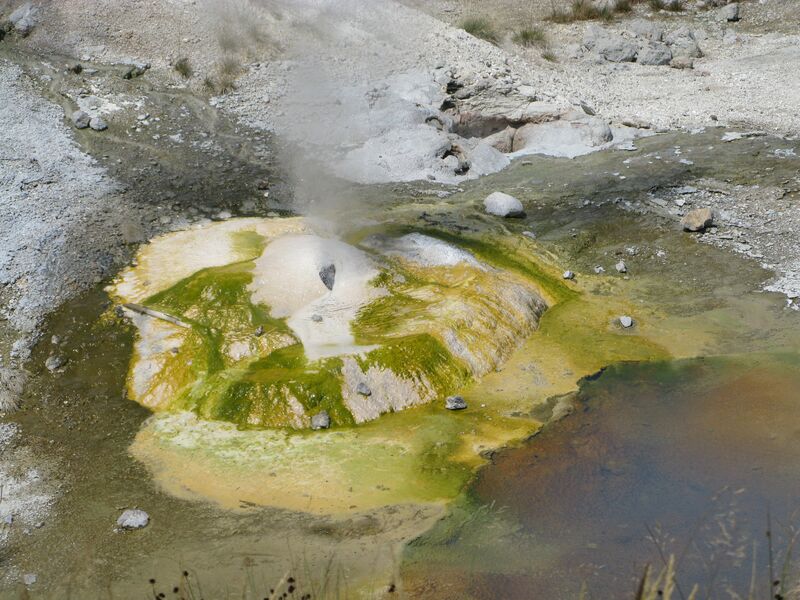 Though the strong stench of sulphur encouraged a brisk pass through, everyone lingered, admiring the myriad colors of nature’s palette that this siliceous sinter – whitish rock– created. 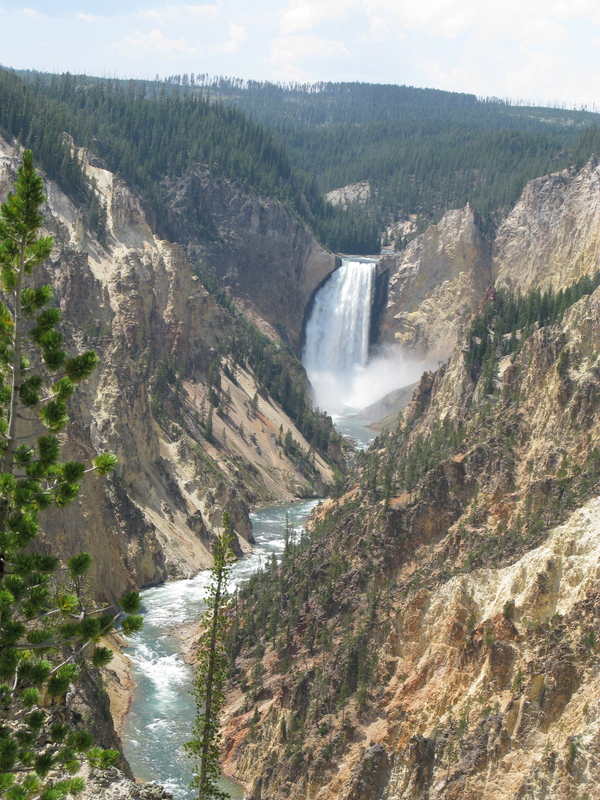 Nestled among the forest of pine trees are rivulets, streams, lakes and rivers — like the Snake and Madison — that meander for long distances throughout Yellowstone. We had a picnic lunch on the skirts of the Gibbon River. Sitting on fallen logs, we enjoyed the melodic flow of clear water over beds of rock. Later in the evening we dined at the Old Faithful Lodge built during the 1920s as a haven for the wealthy. The architecture of this massive inn built with logs is fascinating. On Randy and Chris’ bucket list is a dinner and overnight at each of the country’s fourteen grand lodges. 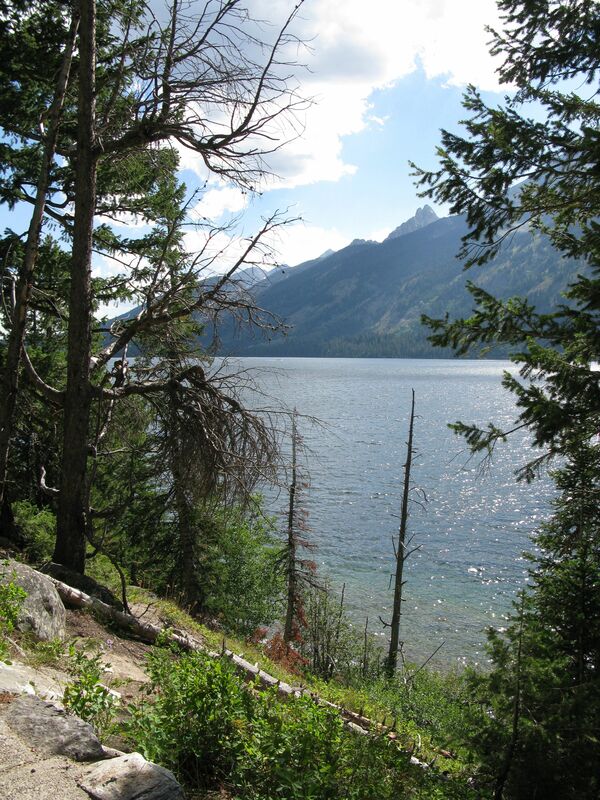 After visiting Yellowstone and the Tetons, I am tempted to add the same to my happiness file. 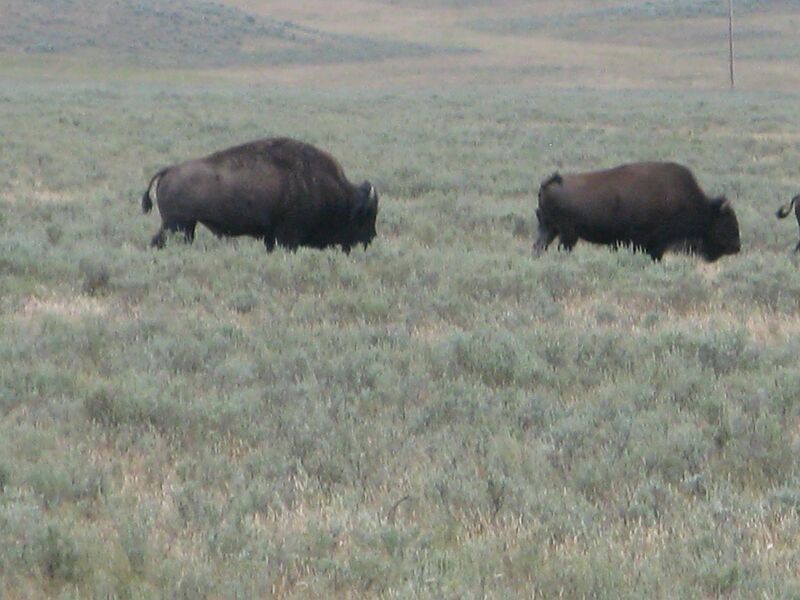 Our day could not have ended more perfectly with the herds of bison roaming the plains. We stopped by the side of the road as they ran freely. Their lithe gait seemed at odds with their huge bulk. We saw mothers with their young. Others were at play. And as we continued our journey, we saw bison slowly crossing the highway oblivious to the traffic jam and gazing tourists. A ranger standing in the middle of the highway was carefully observing the scene, assuring no contact between beast and human. 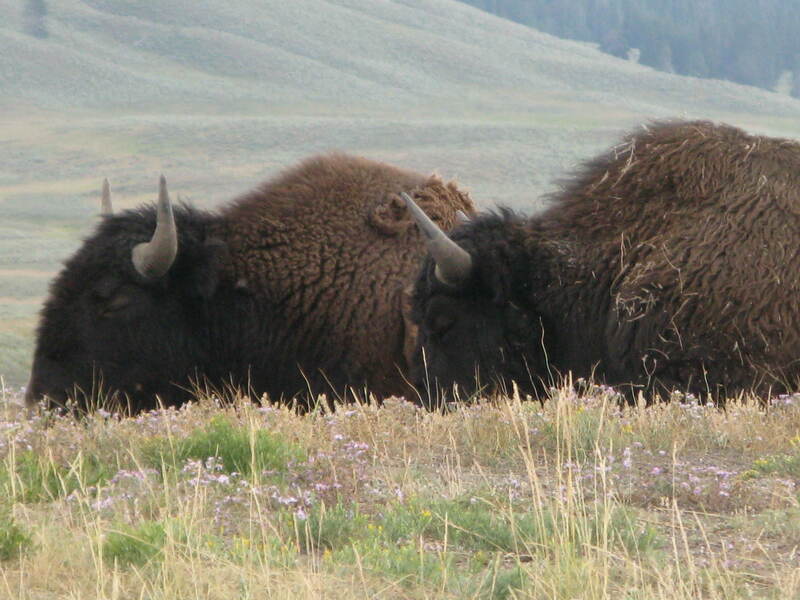 As our car passed, we were able to get within close proximity to those lounging along the edge of the road. August 3. After a slow start to the morning, we explored the Tetons more intimately. 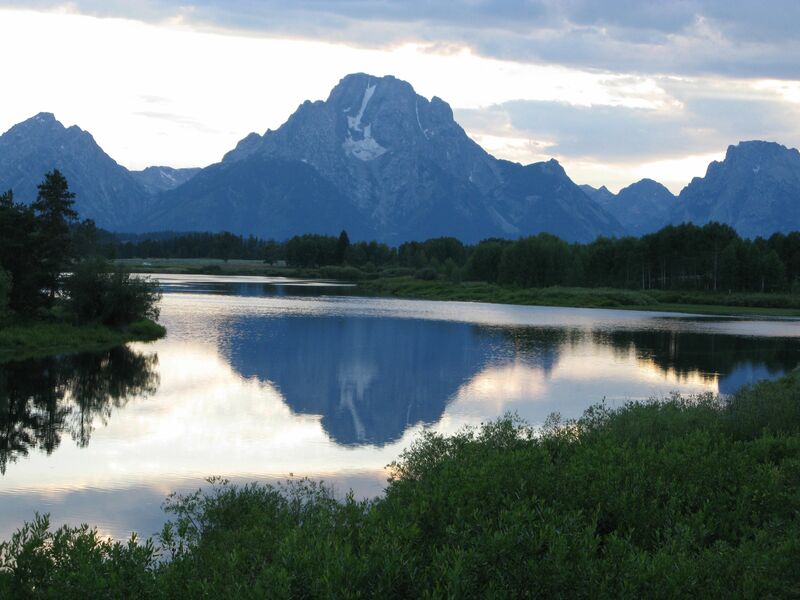 The Tetons are beautiful, majestic mountains formed by two seismic plates rubbing against each other millions of years ago, one bolting upright to create eastern vertical face of the Tetons; the other, jutting downward to create a string of lakes and the valley floor on the eastern side. French trappers gave it its name because the three peaks resembled teats. 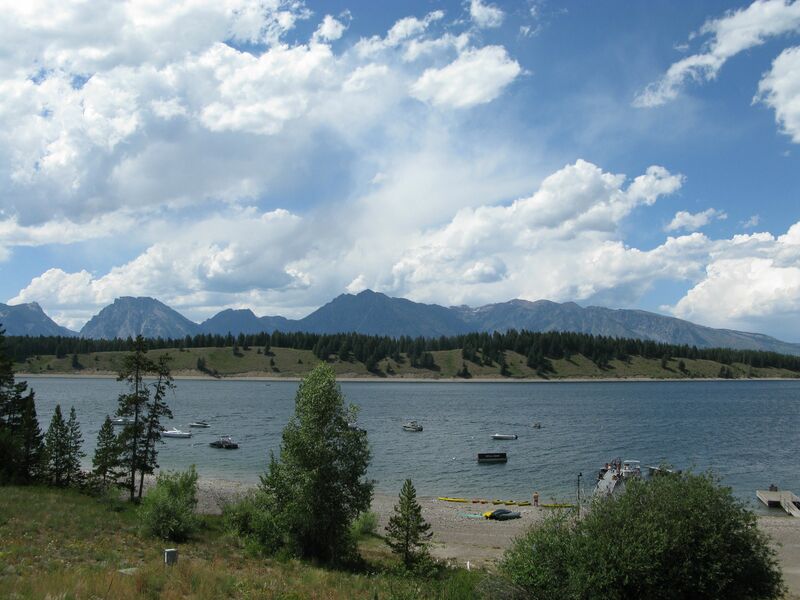 The eastern side is more dramatic with its towering appearance that shoots up directly from the lake; the western side has a softer, more sensual appeal with its sloping hills. Either view stimulates the imagination. 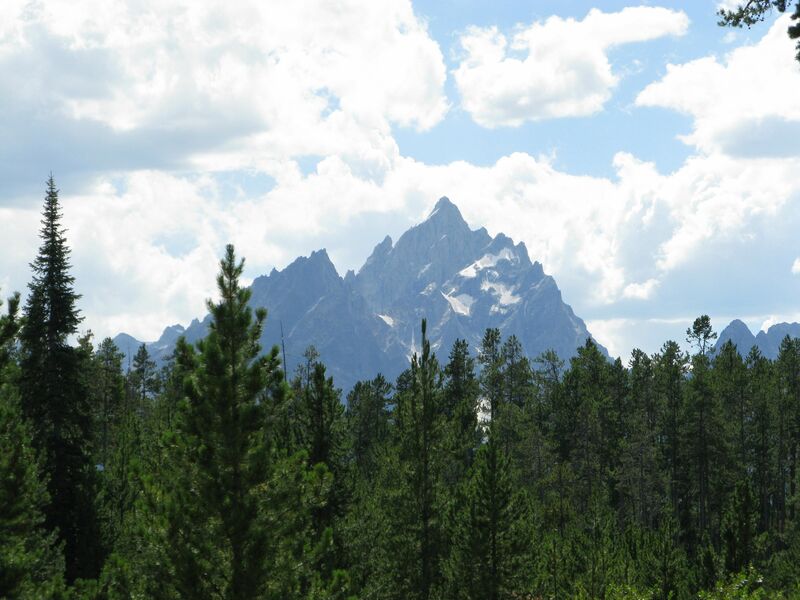 Perhaps the most memorable part of our visit to the Tetons was the Laurance S. Rockefeller Preserve, formerly a vacation retreat for the Rockefellers. On the site is a LEED platinum certified educational center and museum where visitors can learn more about the park’s wildlife and natural habitat. Unique to this center are the meditative rooms where we sat quietly listening to nature’s music — the whistling winds, the rustling of leaves, thunderstorms, the chirruping of birds, cascading waters, or the vocalization of four-legged creatures like Elk or the Grizzly Bear. The experience was spiritually uplifting. There were also educationally artistic videos to watch. On the walls were stanzas of a poem by Terry Tempest Williams. One stanza that particularly appealed to me was “Nature quiets the mind/by engaging with an intelligence larger than our own.” We lunched later in the day en plein air at the Signal Mountain Lodge in full view of the Tetons. 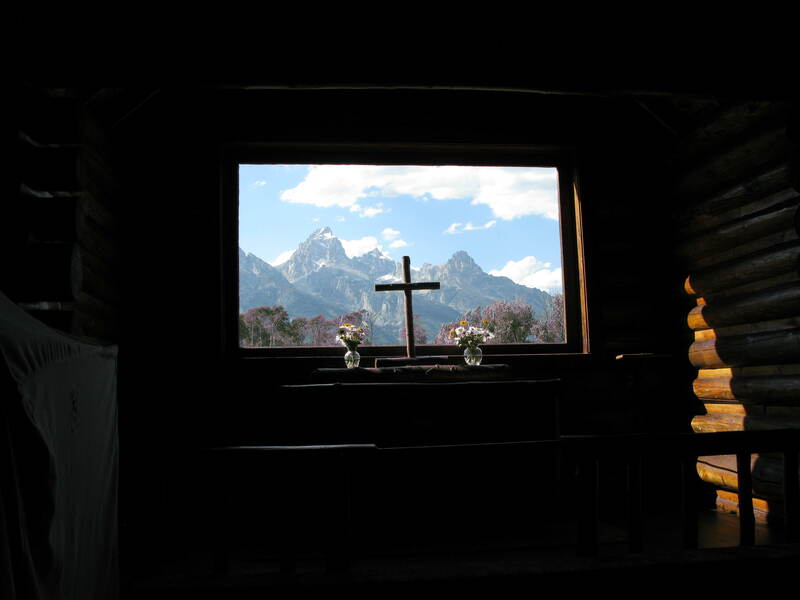 After lunch we visited a quaint little Episcopal Chapel of the Transfiguration whose small window in the sanctuary framed the Tetons. 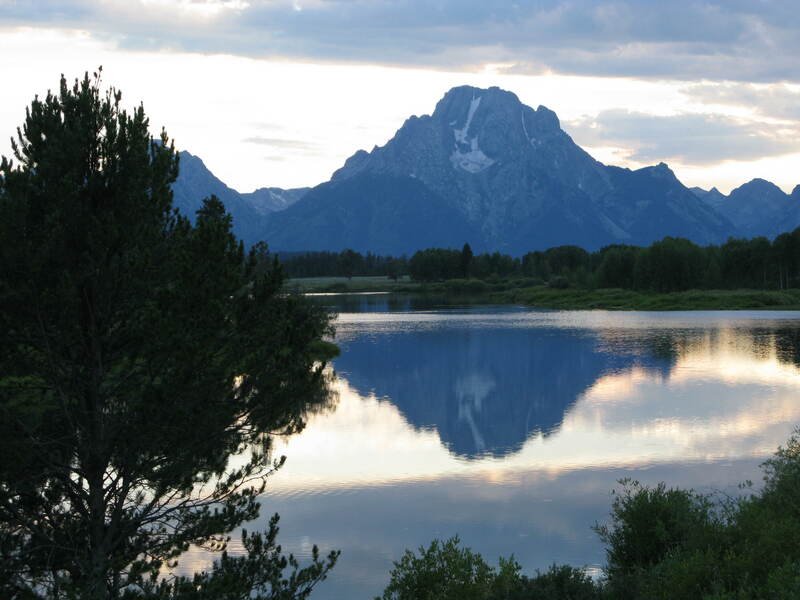 Later in the evening, on our way home, we could not resist stopping to watch the sunset over Mount Moran, mirrored in the lake below. 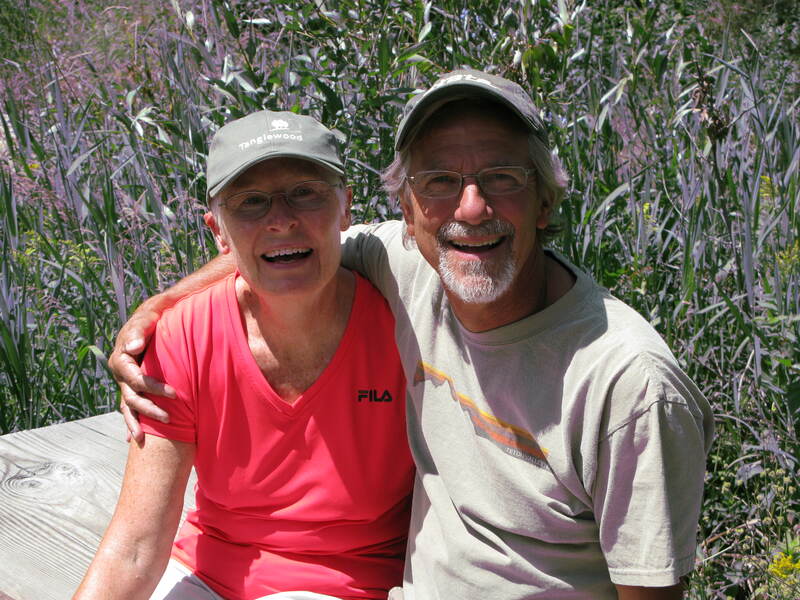 On Friday, our last day in the Tetons, we relaxed in the morning, picked weeds in the garden with Chris while Randy watered his beautiful wildflower gardens. In the afternoon, we visited downtown Victor for Huckleberry shakes, a local cultural treat that cannot be missed. And to round out the day, Randy and Chris invited us to the town’s weekly winetasting at Alpine Wine and Bistro in Driggs, a neighboring town. The proprietor, a friend of theirs who lives just up the slope above them, was expecting us. Since Randy had alerted him that we were former French professors, he was eager to learn the proper French pronunciation of the five featured French wines. Each of the wines was quite good, offering different sensations to the palate; the least favorite was the Sauvignon Blanc. Melanie and I have found no equal to New Zealand’s Sauvignon Blanc. Entertainment was provided by a father-daughter duo; he played the keyboards and the harmonica and she sang with a mellifluous tone. I would love to hear Jeff Jones, who plays a really soulful harmonica, and this fellow in a harmonica duet. The ambience, and perhaps the wine, made our feet light as Melanie and I danced a rumba, a tango, a bolero, and a swing. Though we felt we were a bit rusty, we received several compliments. Our teacher, Jan, at Dan O’Day Dance Club, would have smiled gleefully. In spite of the temptation to dance the night away, we didn’t linger and went home early; a thirteen-hour drive to Portland awaited us in the morning. 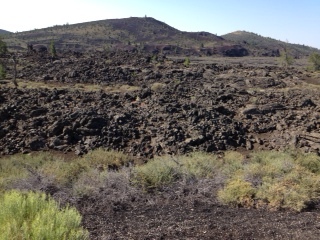 Instead of taking Interstate 84, presumably a quicker route to Portland, we opted to take the scenic drive along Route 20 through the Snake River Plains and eventually to Craters of the Moon, an area of dark craters and cold lava from eruptions that occurred nearly two thousand years ago. 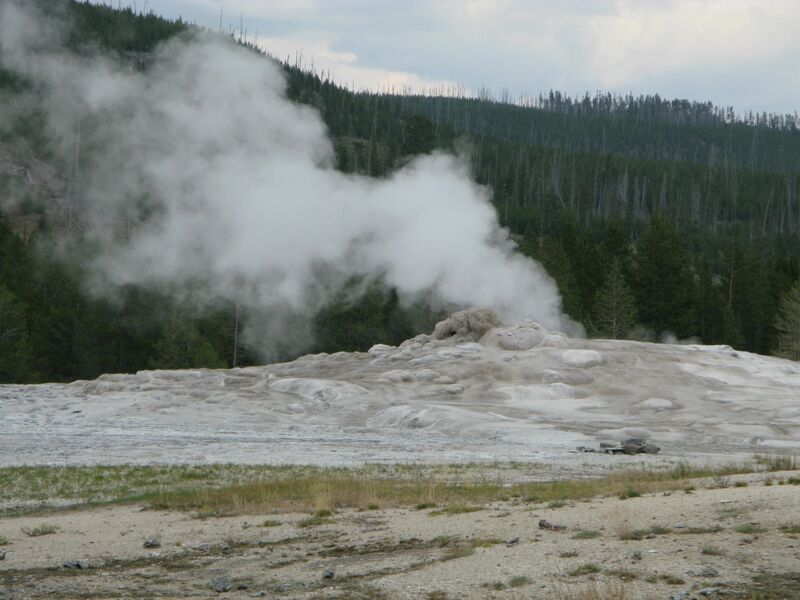 The blackened, scorched earth was a stark contrast to the rich vegetation of the Tetons and Yellowstone National Park. 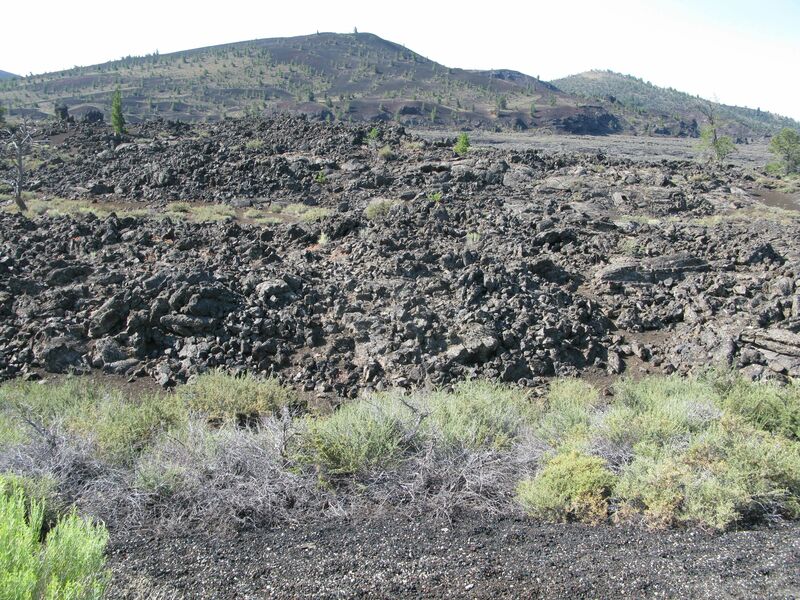 Once past the Craters, the topography remained dry and desolate until we reached the Columbia River on our approach to Portland where once again we were feted with the sight of deep dark green trees.